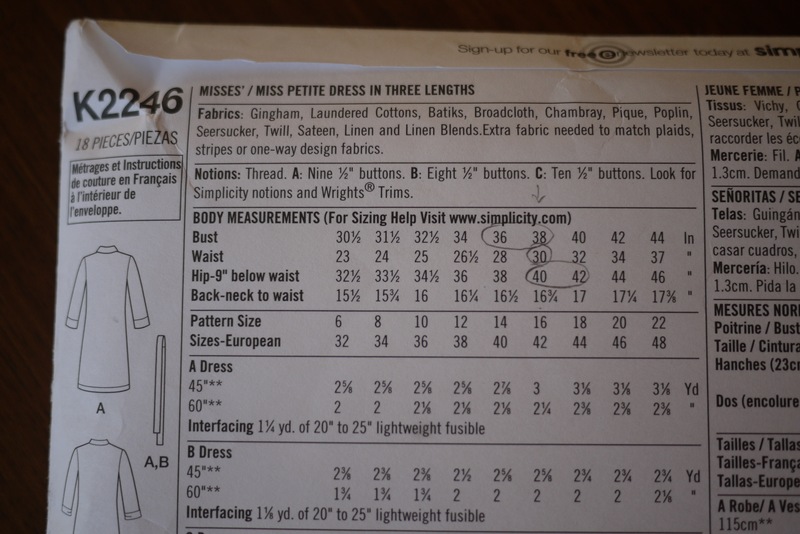 Lengthening or shortening a pattern is probably the most straightforward fitting alteration. It’s also the first alteration you should make, because it could affect any others. So let’s start here – with above the waist alterations. How do you know if you need to alter the length above the waist? I don’t think you need to make a toile to work out whether you need a length alteration. I make this one straight onto the pattern tissue before I dive into any cutting out. Start by measuring your back waist length – you’ll need a tape measure and someone to help you. Strip down to your undergarments, or a slim-fit T-shirt, and get your friend to place one end of the tape measure on the large bone at the nape of your neck. Run the tape measure down your back, (touching your body rather than plumb vertical) until it gets to your waist. This is your back waist length. Mine’s 17.5″ – a bit longer than Ms Average. 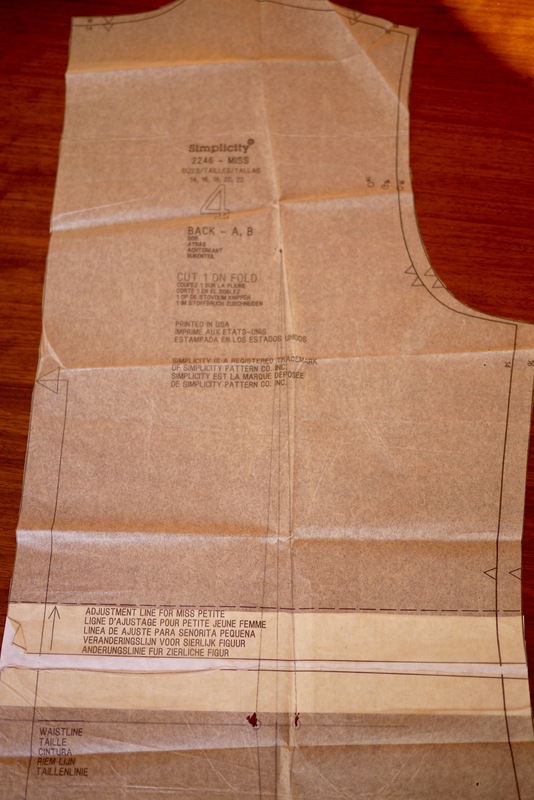 Compare this measurement with the back waist length given for your size on the pattern envelope. If yours is longer you’ll need to lengthen the pattern for a perfect fit, and if yours is shorter, you’ll want to shorten the pattern. Note that the back waist length is different for each size, so it’s important to get your pattern size right first. The back waist length for this pattern in a size 16 is only 16.75″ so I added a bit to the length. I’d say a difference of half an inch or less is nothing to worry about unless it’s for your wedding dress… You might get away with a bigger difference in a loose-fitting garment. Most patterns include markings (and even instructions, sometimes) on the pattern pieces to show you where to adjust the length. If yours doesn’t, then you’re looking for a spot between the armpit and the natural waistline. Here’s my lengthened pattern piece – you can see I’ve added a strip of white paper to increase the length a little. And this brilliantly detailed tutorial from Tilly and the Buttons shows you exactly how to do it once you’ve found the right place. You’ll need to alter any adjoining pattern pieces like a facing on a wrap dress, or the placket on a shirt by the same amount. This is where it pays to be petite. If you’ve shortened your pattern you might get away with less fabric but if you’ve lengthened it you could well need more (including any lining and interfacing). And if the notions you need for the pattern go across the areas you’ve altered, you might now need a longer zip, more bias binding or even an extra button on a shirt. Once you’ve done this alteration, you’ll be able to assess the fit of your bodice better. Is it the right width at the waist? Is the bust point too high or too low? But if you’re making a full length garment, carry on and make any other length alterations next. On a strapless or strappy dress, if you need to raise or lower the bustline you could simply add or subtract length just above the waist. I’m currently doing this on my 50s-style halterneck and I’m pretty pleased with the results. But it won’t work on anything with armholes. You might also need to lengthen or shorten the sleeves on your garment. For long, fitted sleeves, adjust above and below the elbow separately for a perfect fit. If you loathe working with thin pattern tissue, try Swedish tracing paper. You can sew it (and unpick it), so you can stitch up your toile without cutting out again and mark adjustments directly on your pattern pieces. Ink does bleed through it though, so use a pencil or a ballpoint pen to avoid staining your original pattern. And that’s it. No more hoiking your T-shirts down or trying to hide excess fabric behind a belt.